Saturday, May 27, 2017, 2:00 p.m.
Sunday, May 28, 2017, 9:00 a.m. – 4:00 p.m.
Buddha Amitabha. Amitabha is the particular Deity who helps us at the time of our death to attain rebirth in the Pureland. The Refuge Vow is required and will be offered prior to the Empowerment. The cost is $25 general ($20 KDC members). It is also customary to make a donation to the empowering Lama. Sunday, May 28, 9:00 a.m.–4:00 p.m. 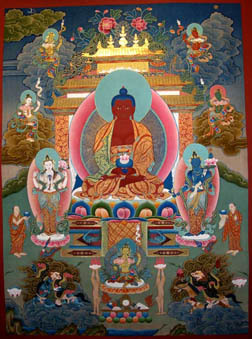 The Amitabha sutra states that even to hear the name of Amitabha is cause to be reborn in the Pure Land of Dewachen. Amitabha practice carries a great blessing and is easy to accomplish. Other Vajrayana practices require many commitments, but Amitabha practice does not; it is easy to do whether one is a Lama, monk, nun or lay person. Venerable Lama Tsang Tsing has accomplished many long Amitabha retreats; this is an excellent opportunity to practice under his guidance. The Empowerment is required. The day will conclude with the Amitabha Special Puja for Deceased. Please click here for full information regarding this Puja for your deceased loved ones. The cost is $30 general ($25 KDC members). The Pecha (practice text) is $15.